I am going to show you about my writing. here is my writing about sweet pea I LOVE it!!!!! sweet pea is a young lady. she is very forgetful. she has chocolate brown hair that is pink-tails. she has a bow in her hair or she will have something like that. sweet pea has a top fill of sparkles that is like the sea but blue a than the sea. her pants are blue and purple pants at the same time. her pants are jeans not tights not anything like that they are jeans with folded up cuffs. sweet peas shoes are dark blue like a blueberry. they are sneakers with laces. she has a rounded bump at the end of her shoes. she has light brown skin. WALT: ask questions as we read to make sure we understand what we read. What is this going to be about? What do I already know that will help me understand? what do I want to find out? does that make sense? what have I learned? have I answered my earlier questions? what else do I want to know? Grace, you always do a lot of thinking as you read to make sure you understand your reading, you are an active reader! You are practising using the strategies we are practising in class to help you 'tune in' to your text before you start reading. As you are reading you can use your fix up strategies to help you warm out what new and tricky words mean. Remember to share your ideas and thinking during group chats, we all want to hear what you have to say. We have been creating a variety of art pieces this term. These pieces are all about ourselves and sharing our stories. We have used different media like collage, watercolour, crayon and clay to create our art. We are beginning to make choices as artists. Each piece of art shares a little about us. WALT: share our stories and ideas through art. Grace, you do 'show you' in your art. You pay attention to detail, have a clear idea about what you want to create and you have a clear message. Your art represents you! You have had a go experimenting with different media, like water colour, collage and crayon, and have created some beautiful pieces! I am looking forward to see what else you can create this year! 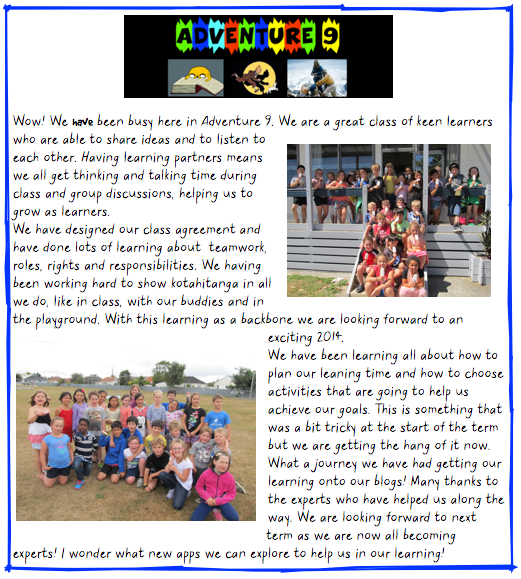 We are on the path to becoming self directed learners in Adventure 9. This means we are beginning to make choices that help us grow as learners. We know what we are learning and what we need to do to get better. We plan our week choosing activities that are going to help us reach our goals. We plan all the must do’s and then add the can do’s. Grace, you are a diligent, thoughtful learner and you strive for excellence in all that you do! You use you learning time wisely planning the must dos before the can dos making sure you follow your plan and have completed all learning tasks. Your next step is to take some more risks in your learning, I would love for you to really challenge yourself, making mistakes is OK, it is when we do some of our best learning! Values are deeply held beliefs about what is important or desirable. They are expressed through the ways in which we think and act. In fact everything we do reflects our values! How am I going showing? I am really good at friendship because i help people. What of the above attributes above do you feel is strongest for you? What of the following attributes do you feel you need to improve on? How do I feel about kotahitanga? Grace, you are a calm and gentle member of Adventure 9. You show kotahitanga in all that you do, quietly helping and supporting classmates, friends and your little buddy.